After missing Shine 40 due to injury, Ivelisse had to forfeit her Shine Championship. LuFisto defeated Mercedes Martinez and Allysin Kay to win the title. 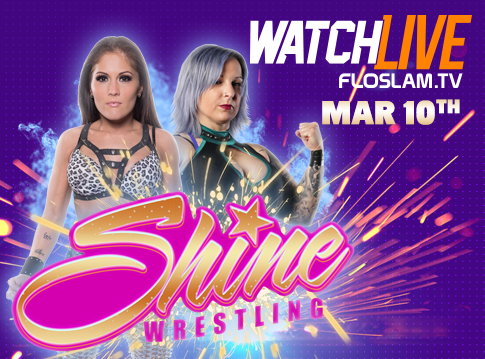 Now, at Shine 41, Ivelisse is back and gets a shot at the title. Lenny Leonard informed fans that Tessa Blanchard couldn’t make it to the show for her match with Thea Trinidad. Out came Brandi Lauren to say she is gonna make herself a star at Thea’s expense. She was such a nice girl at the last Shine show. Malia Hosaka came out and scolded Priscilla Kelly. She said she had no respect for women who come in looking like Kelly, except for the late Luna Vachon. She told Kelly to go back to school and figure out who she is. Priscilla Kelly returned and whined about Malia treating the young girls like crap. She challenged Malia to a match at Shine 42 and they had to be held back by officials. The women begrudgingly shook hands after the bell. Kid Cadet interviewed LuFisto, who said it was good to be an honest and defending champion. She said she can beat anyone with the Burning Hammer. The lights went out and slow music began to play. A spotlight appeared by the entrance, where two women came out. They handed an envelope to LuFisto. The music stopped, they left and LuFisto made Kid Cadet read it. The note told LuFisto to be ready for the red wedding at the WWN Super Show. The lights cut out again and when they came back on Su Yang appeared in the ring. Blood poured from the ceiling onto her and a frightened LuFisto left. Overall: 4.5/10. Not one of the better Shine shows. Most of the first half of the show severely lacks in quality. Lots of sloppiness from several workers. However, there is some good out there. The four way fray was rather fun and I was impressed with Brandi Lauren. The last three matches is where the show steps up with all being strong outings. I liked the different and out there closing segment to set up the next title match. They also did well to set future angles up with ACR’s turn and the advancement of Kay’s overall arc.